Umeboshi are pickled ume fruits, often called plum but are actually closer in relation to apricots. The little orange-pink fruits are round and wrinkled and pickled into umeboshi by using salt and vinegar. Umeboshi is common in Japan and are considered to be a sort of super food – good for digestion, preventing nausea, helping with hangovers, fighting fatigue and protecting against aging. According to Wikipedia, eating umeboshi in Japan is like eating an apple a day in the U.S. 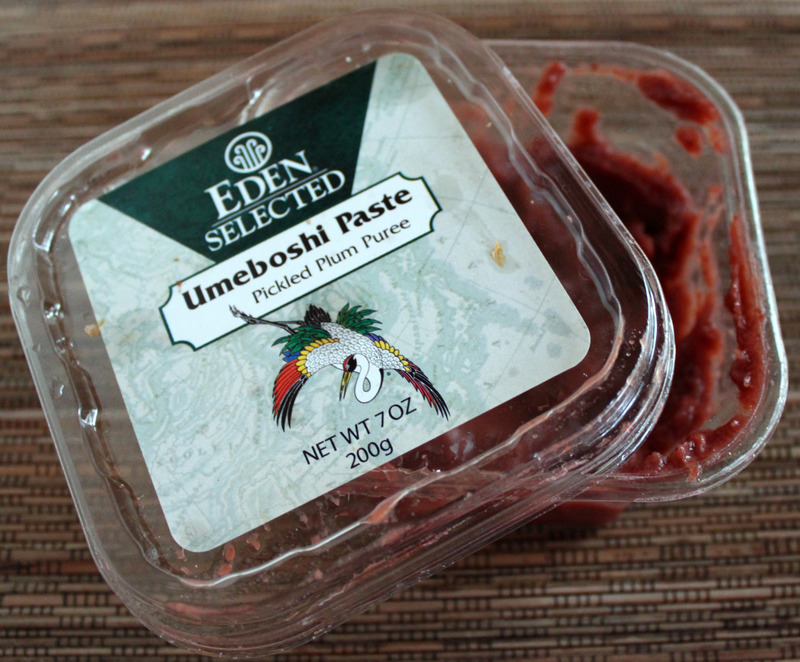 This sounds really promising, but like many health foods, umeboshi have a less than desirable flavor. They are incredibly sour and salty, which made it an interesting challenge for me to make them into something delicious. Traditionally, they are used in rice balls and can also be used in sushi, hot water and to compliment green tea. 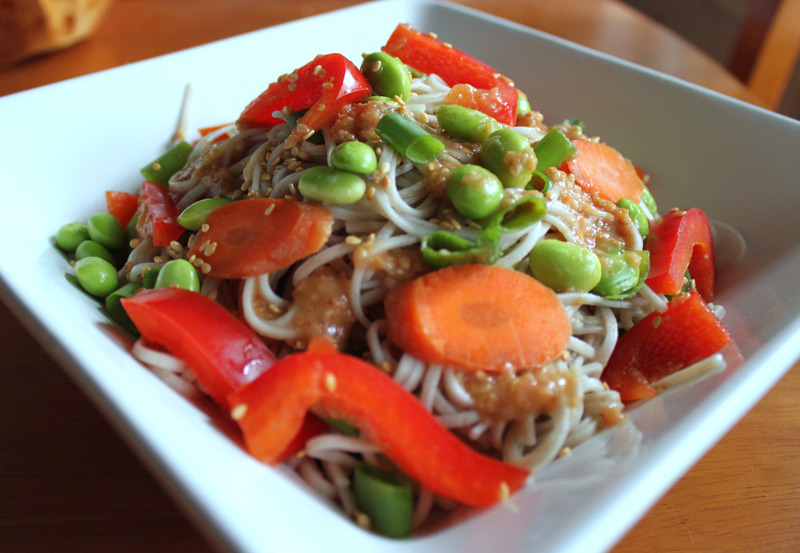 I chose to make a dressing out of umeboshi and used several complimenting flavors – a little sweetness from honey and fresh orange juice, a tiny bit of sour lemon juice, plus rich toasted sesame seed flavor. You can adjust the different ingredients to taste depending on how much you like the taste of umeboshi. 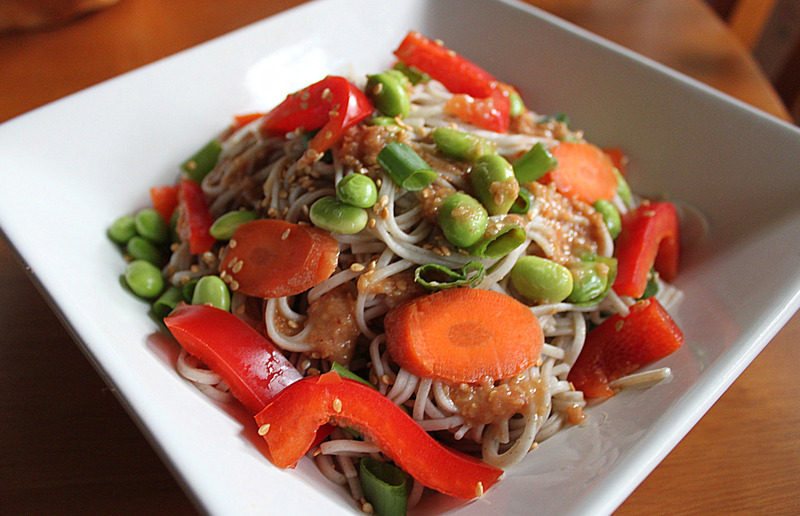 Tossed with light soba noodles and tons of fresh veggies makes a perfectly refreshing spring dinner. Toast sesame seeds by cooking in a dry frying pan over medium heat for 3-5 minutes or baking them in an 350 oven for around 10 minutes (or until lightly browned and aromatic). Combine all ingredients in blender or food processor and blend until well combined. Add more honey or umeboshi paste to taste. Cook noodles according to directions on package. After cooking, drain water and rinse noodles with cold water. Thinly slice carrot and bell pepper. Chop the green part of the green onions. 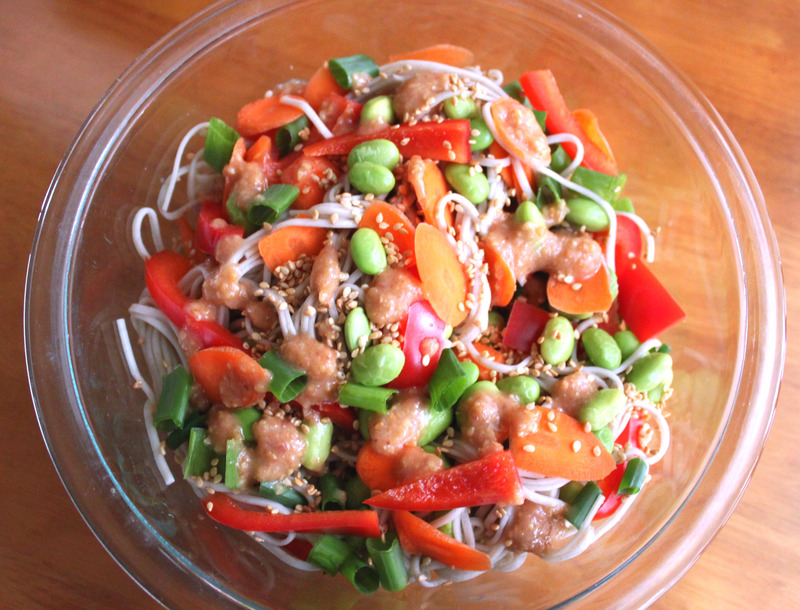 Combine all ingredients and add Toasted Sesame Umeboshi Dressing from above recipe. Toss together to coat everything and serve cold. Week 2: What is a Kohlrabi? « Peeps Diorama: "All the Single Bunnies (Put a Peeps on it)"